It had been way too long since I had been out hiking, so I planned a trip up the shortest of the 4,000 footers for a Sunday afternoon. The forecast called for a partly cloudy day, so I gambled and hit the road. By the time I reached the trailhead, it was mostly cloudy, but had been both sunny and gloomy. Mt. 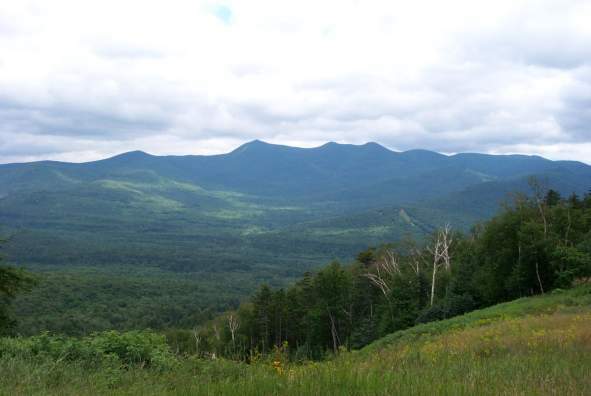 Tecumseh stands at 4,003 feet, the shortest of the AMC�s 4,000 footers list. 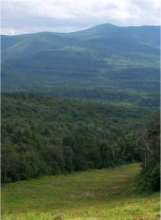 The trailhead sits at the base of Waterville Valley Ski Area, only 75 feet from the lodge. 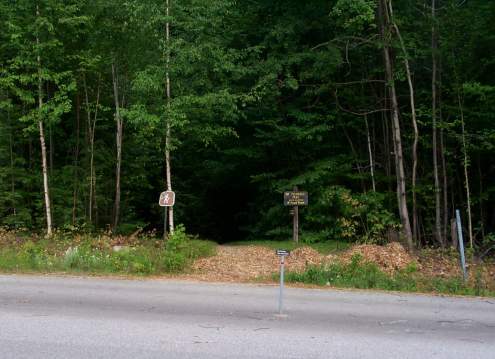 It is easiest to get to the trailhead by parking in Waterville Valley�s Parking Area #1, since the trail is directly across the access road. Once finished with preparation, getting started on your trip takes only minutes. After parking, I was anxious to get going. I took my "before" picture and moved to the trailhead. The beginning of the hike was good for getting my legs back into hiking, since the trail starts a moderate though definite grade right away. 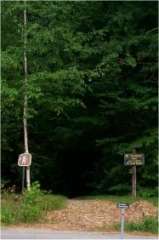 As in most areas of the WMNF, the trail is mostly devoid of rocks and heavy roots at the beginning, but then changes to rougher conditions further on. This is true of the Tecumseh Trail as well. For the first � mile, the trail follows a stream and is very easy to follow, as it is blazed with yellow. As I understand it, this wasn�t always the case. Several sources have indicated that the trail is difficult to trace, but this has been remedied with well placed yellow blazes. At about � mile, the trail splits to the right and traverses the stream. This point is confusing, since the trail seems to both follow the stream and cross it. However, a double yellow blaze tells that the real route is over the water. 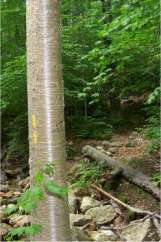 From this crossing, the trail leaves the stream and begins a more serious climb for about another � mile, then begins a short decent to cross the stream again. At any of these crossings is a great opportunity to splash around and enjoy the mountain water, which I did (I�m still a kid at heart!) Past this stream, the climb continues again in earnest. 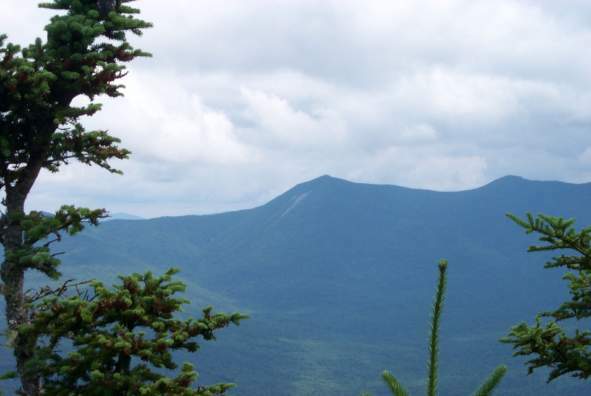 About 1/8 mile further on, the Tecumseh Trail offers a small detour to the Waterville Valley slopes to grab the first real view. 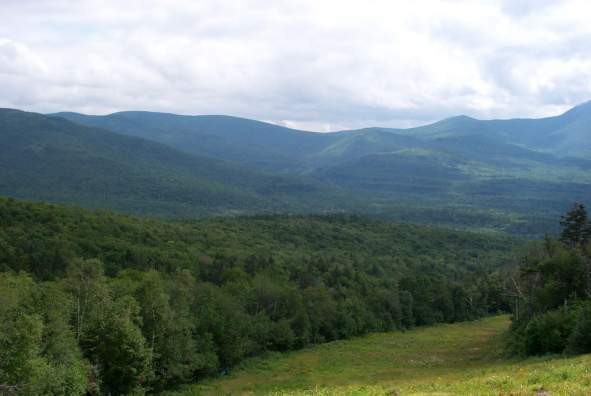 As can be seen, the ski area offers some great scenery. As if that weren�t enough, another 1/10 mile further there is another, similar opportunity. The trail continues on its steady climb, widening in spaces and narrowing in others. By this point, the rocks and roots are significant in every step, but are fairly easy to navigate. 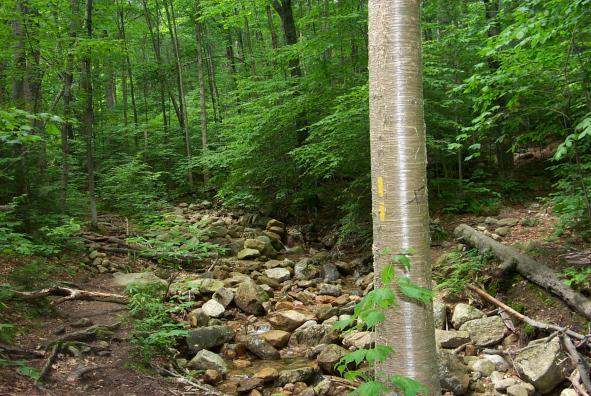 At about 2 miles, the trail offers an interesting diversion � get to the summit by going up OR down. I chose up, the trail narrowed, and within 5 minutes I was at the summit. Total time from the parking lot to the summit was about 1:45 to 2:00. The top of Tecumseh is pretty wooded and views are only available east to northeast. The weather held for me, and I was able to see Osceola and Tripyramid without too much trouble, plus some others in the range. Here at the summit I met some people from Manchester that I promised I would make famous, so check out their picture below. 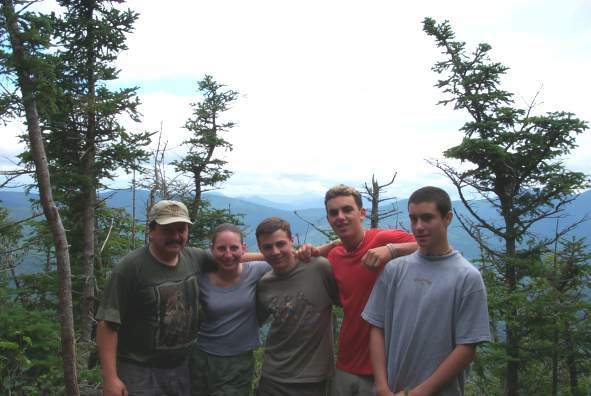 This is, from left to right: Rick Soucy, Alicia Soucy, Brian Soucy, Jeff Laurendeau, and Dan Boissonneault (if I messed that up, please e-mail me!) 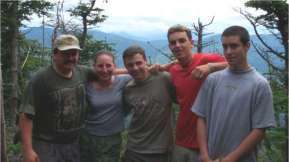 They are all active in the Boy Scouts in Manchester. After a 30-minute rest, I headed back down the same way I came up. The sun had started to hide behind a seriously clouded sky, and since the relative humidity was up, some of the rocks became slippery. Footing became a little more challenging, but wasn�t too bad. I moved quickly and reached the parking lot after about an hour, tired, but satisfied. The whole trip took about 4 hours with generous rests and picture taking opportunities. The close, Mt. Tecumseh via the Mt. 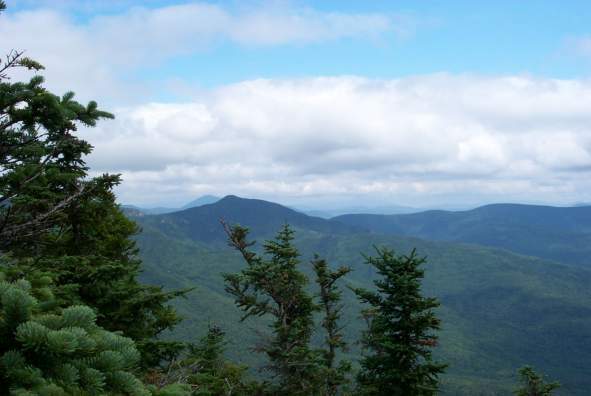 Tecumseh trail is a moderate (2.5 miles, 2200 ft. elevation change) hike with excellent, although limited, views. The trail is now easy to follow and varies from 1 foot to 15 feet wide, flat to rocky. Total trip time is reasonable, and the rewards are well worth the effort.